தமிழ் மொழி மூலமான அல்குர்ஆன், விளக்கவுரை, ஹதீஸ் கிரந்தங்கள் மற்றும் இஸ்லாமிய விடயங்களை www.tamililquran.com எனும் இணையத்தளம் ஊடாகப் பார்க்கலாம். 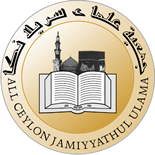 All Ceylon Jamiyyathul Ulama is the apex religious body of Islamic Theologians that provides religious and community leadership to the Sri Lankan Muslim Community who are 9.6% of the total population of the country. This institution was established in the early part of the 20th century (in 1924) and has progressed with struggles and careful strides to the expectation of the Sri Lankan Muslim community for well over 87 years. It was incorporated by the Act No. 51 of 2000 of the Parliament of the Democratic Socialist Republic of Sri Lanka. As it were, ACJU, the institution that has been striving for the last 8 decades for the Muslim community’s spiritual and temporal advancement, has established 25 districts and 102 divisional branches; and enrolled over 5000 theologians as its members, most of whom are holders of doctorates, special degrees, master degree or 1st degrees. Promoting and preserving the concept of “Dheenul Islam”. Maintaining and promoting tranquility among Muslims, especially among the theologians. Address: 211, Orabi Pasha Street, Colombo 10.
abdul jawath wali trust,abdul jawwath aalim mawathai,kattankudy 06. எமது இணையத்தளம் உத்தியோகபூர்வமாக வெளியிடுவதற்கு (04-02-2012) முன்னர் நாங்கள் எமது பக்கங்களுக்குத் தேவையான அனைத்து விபரங்களையும் (உதாரணமாக: பள்ளிவாயல், குர்ஆன் மத்ரஸா, இஸ்லாமிய அமைப்புக்கள், அரபிக்கல்லூரிகள்) விபரமாக மின்னஞ்சல் மூலம் கோரியிருந்தோம். கிடைக்கப்பெறவில்லை.